More of a side quest than a crusade. Match-3 style games might be the most popular mobile genre out there. A subcategory that has a strong following as well is the match-3 style RPG, these games add RPG and fighting elements to the familiar match-3 puzzle game. 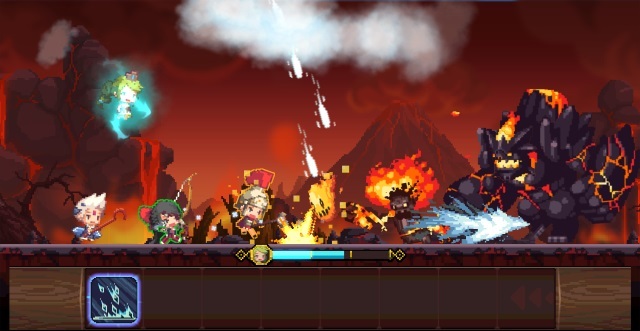 Crusaders Quest looks to put its own spin on the match-3 RPG. Crusaders Quest is a match-3 style RPG, in which you are in charge of a band of heroes that must save the world from the darkness and evil that a witch has brought unto the land. The game is pretty simple to play and is unlike most match-3 games. There are tiles on the bottom of the screen that you press to do your attacks. Instead of you sliding tiles into place to match them, you can perform attacks with one to three of the same tiles. There is only one row of tiles that you need to focus on. The main focus of the game is the attacking actions of your characters and it doesn't disappoint. The game has a very retro feel, with it's 8-bit graphics and sound. The game has a charm to it and seeing it in action can get you hooked. The other big draw to the game is it's collection of heroes. Your party can constantly grow and expand to bring in new heroes to help you battle the darkness. Each hero can be outfitted with new weapons and have their skills upgraded, so there is a lot of customization options available. The game has a lot of quests, so there are enough enemies to go around for all of your heroes. Crusader Quest requires an Internet connection to play, so if you are worried about your data usage than you need to be connected to wifi. If you have neither than you are out of luck. The game also works on a stamina system in which you use a piece of your stamina every time you go on a quest. This means once it runs out you have to wait or pay money to keep playing. The freemium charges don't end there. Upgrading your characters or buying different weapons takes a lot of grinding through quests to earn the essential money. While the game doesn't force it upon you, it strongly pushes you toward spending real money to quickly do these things. Crusader Quest is an ambitious match-3 style RPG. The game has a very retro look and sound, with an interesting story and gameplay mechanics. The problem is that it gets bogged down by the different freemium features that you see in most free to play apps. The game also requires an Internet connection and many people may not want to use there data up to play this. If you want to play this game there is a lot of waiting involved, as you get further along.